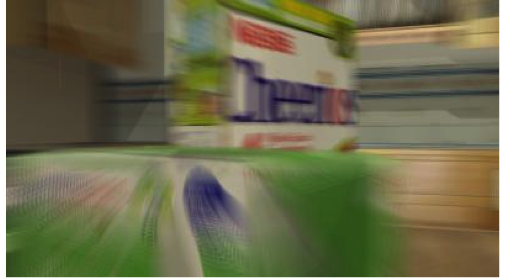 Contemporary British artist David Theobald uses digital composition techniques and computer-generated animation to produce work that often resembles the high quality, colour-saturated hyperrealism of commercial computer-generated animations like those produced by Pixar and DreamWorks Animation studios. However, although his works might resemble the visual aesthetic of these commercial studios, Theobald’s animations spend their entirety focusing on places and objects that would appear in a Pixar animation only very briefly and most likely somewhere in the background. The intensive labour that goes into Theobald’s animations is perversely used to produce images of everyday objects and scenarios that would normally be deemed unworthy of prolonged attention. His vibrant animations use humour and wit to engage spectators, yet their banal subject matter, lack of narrative action or structure and extended duration (most of them are intended to play on a continuous loop) test the limits of spectators’ comfort and patience. Although in interviews and artist statements Theobald positions his work principally in relation to a Marxist-based critique of commoditized art and the excessive consumer values of late capitalist culture, in this article I am more interested in reading his animations as being in dialogue with a kind of post-humanist, ecophilosophical ethics. In particular, I propose to examine Theobald’s works in relation to several concepts that have arisen out of a fairly new movement in contemporary philosophy called speculative realism. Very briefly, speculative realism is a broad term that encompasses a number of different philosophers’ ideas, but one thing that unifies these philosophies is their opposition to what philosopher Quentin Meillassoux has called “correlationism”. A fundamental problem for philosophy has always been the question of access (e.g. how do we really know the true nature of the universe that exists beyond ourselves, when we can only access the world through our senses?). Correlationism refers to the tendency in contemporary anti-realist philosophy to root all knowledge in the correlation between human mind, language and world. Correlationist philosophies, as speculative realist philosopher Ian Bogost notes, consider that “if things exist, they do so only for us.” Speculative realism is an attempt to escape from this supremely anthropocentric mode of thinking. The concepts that are most productive for thinking about David Theobald’s work arise from speculative realism’s opposition to the anthropocentrism inherent in correlationism. The subset of speculative realism that I refer to most in my analysis of Theobald’s works is called “Object-Oriented Ontology” (OOO, for short), pioneered by philosopher Graham Harman. OOO, or “onticology” as Levi Bryant calls it, “attempts to think the being of objects unshackled from the gaze of humans in their being for-themselves.”Bogost states, “OOO puts things at the centre of being. We humans are elements, but not the sole elements, of philosophical interest. OOO contends that nothing has special status, but that everything exists equally—plumbers, cotton, bonobos, DVD players, and sandstone, for example.” When I suggest that Theobald’s works are post-humanist, I am referring to Bryant’s assertion that a post-humanist ontology is one in which “humans are no longer monarchs of being, but are instead among beings, entangled in beings, and implicated in other beings.” I argue that Theobald’s choice to focus on the most banal of objects as subjects can be understood to be in sympathy with OOO’s “democratization of objects”. Timothy Morton has pointed out the obvious link between OOO and ecophilosophy and ecocriticism. A philosophy that places all objects on an equal plane of existence (what in OOO is called “flat ontology”) stands in contrast to the alarming disregard that human civilization, primarily in the form of capitalist economic systems, has for the environment, other beings and objects. When I propose that Theobald’s works can be understood as ecophilosophical, I do not mean to suggest that they are strictly environmentalist in the sense that they directly depict environmental issues or even an immersion in natural environments—in fact, they often depict exactly the opposite—but I want to suggest they are ecocritical in the sense they implicitly critique the unethical effects of anthropocentrism. The perspectives that Theobald’s animations simulate most often lack a sense of human presence (diegetically, that is; the presence of the human spectator as witness to the depicted events will be addressed later in the article). In his works, spectators witness the normally unseen lives of objects, which may be sentient or non-sentient (according to OOO everything is an object, be it a human being, a computer, a quark, a budgie, or an idea). I want to suggest that Theobald’s animations can be considered as kinds of philosophical thought experiments where human absence is visualised. His works invite spectators to consider the nature of non-human objects in their autonomous integrity, as Andrew Ramsey asks Lily Briscoe in Virginia Woolf’s To The Lighthouse to “think of a kitchen table […] when you’re not there.”However, as artistic representations, they offer an unavoidably imperfect answer to Bogost’s impossible question of “what it means to be something”. For the purposes of this article, I am separating Theobald’s animations into two categories.The first includesworks that depict largely non-sentient objects in everyday scenarios from a fixed point of view (e.g. an empty commuter train in The Winnerish Triangle (2009); blinking electronic router panels in The Cloud (aka All of Our Agents Are Busy) (2013); a kebab shop window in Kebab World (2014)). The perspectives represented in these works resemble those of a camera on a tripod, or perhaps, as I would like to suggest, the simulated points of view of objects themselves. The second category is comprised of works that simulate scenes viewed from the embodied perspectives of sentient non-human beings (e.g. a fly trapped in a kitchen in Buzz (2008); a fish swimming around a tank in New Atlantis (2008); a budgie in its cage in Trill (2010)). I argue that the formal techniques used in the former category are in keeping with certain avant-garde cinema techniques that can be productively considered in terms of a “democratisation of objects”. The second group of works use techniques that are more particular to animation to render dynamic, embodied perspectives that I will address in terms of the “critical anthropomorphism” inherent in Bogost’s notion of alien phenomenology, or the effort to describe objects in and for themselves and their relations to other objects. An example of one of Theobald’s object-oriented works is his 2007 animation Office. 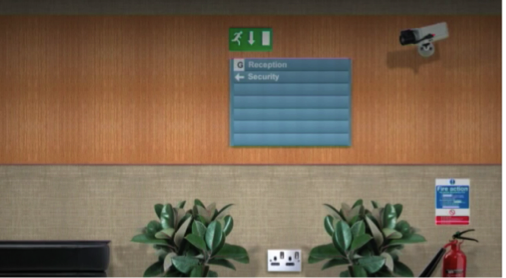 Office is an eight-minute animation of an empty elevator endlessly travelling between the floors of an anonymous and unpeopled office building. Spectators are presented with a fixed point of view from the centre back of the elevator’s interior as the doors open and shut at each new floor. 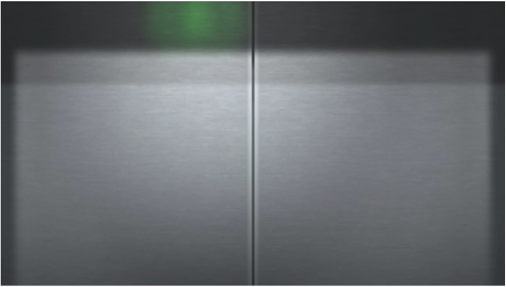 The sequences between floors depicting the closed, subtly shifting elevator doors last an average of seventeen seconds, while the ones revealing the floors last anywhere from ten seconds to nearly half a minute, offering spectators ample time to examine every aspect of the image several times over. Theobald’s minimalist animation style is striking in its slowness and stillness. However, there are subtle movements to be noticed in each sequence, for instance in a slowly bobbing balloon tied to the water cooler on the “Administration” level, a blinking red light on the surveillance camera on the “Reception” level, floating fish in a small aquarium on the “Human Resources” level, etc. On the soundtrack we hear the constant hum of the elevator as it makes its way between floors, the sounds of the doors themselves, and each floor has its attendant sounds as well (e.g. police sirens in the distance on the ground floor, or the rough rumble of machines in the basement.) Works like Office are meant to be humorous. The perverse novelty of animating this particular subject first appears as a wry joke(why would anyone take the time to film these banal events, much less animate them?). Clever details are often hidden in the images of the different levels (e.g. 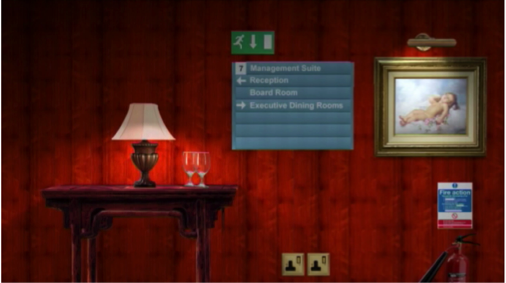 decadent red wallpaper and empty wine glasses on the “Management” level), creating a kind of anticipation for what will appear next. However, over the course of the animation, it becomes clear that at least one way of interpreting the work is to take it seriously and consider the nature of an elevator’s interactions with the different levels of an office building (see figures 1-3). […] during long takes we are invited to let our eyes wander within the parameters of the frame, observing details that would remain veiled or merely implied by a swifter form of narration. In terms of storytelling, the familiar hegemony of drama, consequence and psychological motivation is consistently relaxed, reaching a point at which everything (content, performance, rhythm) becomes equivalent in representation. The slow stillness and extended duration of Theobald’s animation style operates in much the same way that MacDonald argues that these qualities operate in ecocinema.Unusual for animation, Theobald’s minimalist style in his object-oriented animations asks spectators to slow down and explore what they are seeing—an action that is aligned in MacDonald’s eco-film-criticism with a kind of respectful mindfulness of our place in the world. Flanagan’s suggestion that in slow cinema “everything […] becomes equivalent in representation” has obvious connections to the theorisation of the democracy of objects in OOO. Theobald’s refusal to cater to conventional narrative expectations, denying spectators their attendant gratifications, serves to remind them of the fact that everything is not always selfishly, anthropocentrically, for us. When watching a visual representation of phenomena without any centring anthropomorphic actants, we often “lose interest” owing to lack of emotional motivation or the cognitive analysis of the perceived, a fact which many makers of experimental films have discovered when presenting their films to a mass audience. However, the fact that Theobald’s modernist distanciation techniques, if they can be so-called, are rendered in a style that resembles the visual aesthetic of mainstream animation studios breathes new life into these older techniques. His work purposefully plays off of spectators’ expectations of mainstream narrative animation, potentially drawing the interest of spectators who might otherwise be put off by works that seem “too avant-garde”. That these animations are viewed in a variety of contexts (at art and animation festivals, in galleries and online) increases the possible diversity of their potential audiences. In addition, Theobald expressly uses humour to draw spectators into the spectacle and to encourage them, as he says, to “sustain interest in a subject beyond when someone might otherwise get bored, perhaps allowing other more subtle sensory aspects of a work to become apparent.” Theobald has observed that humour “lowers barriers and encourages people to think laterally and make connections” between the works’ “simple” imagery and all of their possible implications.Moreover, many scholars have remarked on the pristine illusionism and haptic textures that computer-generated imagery offers, commenting on the special “allure and fascination of the [computer-generated] image itself.”Computer-generated animation adds emphasis to the objects it depicts through what Andrew Darley has called its “heightened sense both of naturalism and illusionism”. The visual appeal of the computer-generated animation itself is an invitation to notice the objects in Theobald’s works in a way that they might not be if they were live-action representations of the same things. As such, they encourage spectators to take special note of these non-human objects as objects worthy of fascination and scrutiny. In the computer-animated feature-film, there is […] a deeper interest in objects as objects rather than objects as humans […]. The reversal in agency from human ánthrōpos to non-human morphē is often articulated through dynamic point-of-view subjectivity, a degree of perspectival intrigue, and a continuous innovation of spectator viewpoint. 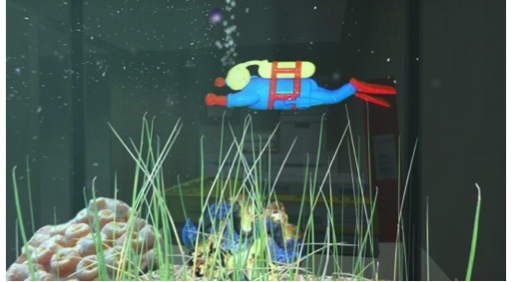 Although computer-generated animation enables spectators to witness events at a scale and from perspectives that would be largely impossible with live-action film or the naked eye and are thus able to emphasise the perspectives of non-human objects, the anthropomorphic characters in mainstream narrative animations remain first and foremost conduits of experience made accessible to and for us. Mainstream narrative animations hierarchise these anthropomorphic objects over all other objects in the film. Most of the objects in these worlds are all painstakingly animated only to act as background to the human-like agents that are acting onscreen, propelling the narrative forward. The works of Theobald’s that I have placed into the second category make full use of the fluid omni-directionality of computer-animation’s virtual camera. 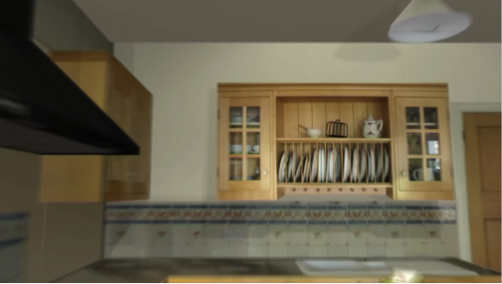 For example, Buzz presents spectators with a hyper-kinetic first-person (or, rather, “first-object”) perspective of a fly as it frenetically circles the interior of a kitchen (see figures 4 & 5). 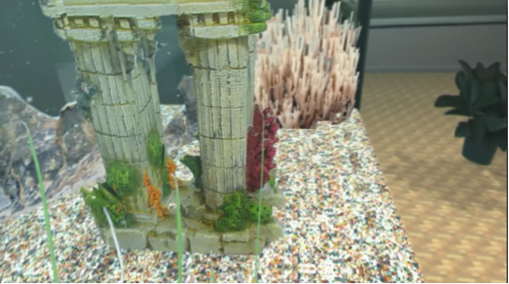 New Atlantis depicts the first-object perspective of a fish swimming endlessly around a small tank in a closed estate agents’ office at night (see figures 6 & 7). Buzz and New Atlantis, which are intended to loop indefinitely, convey a sense of the monotony and alienness of these creatures’ lives. Rather than leading spectators on a linear narrative trajectory, these animated objects circle around, ceaselessly repeating their purgatorial actions. Works like New Atlantis and Trill also raise potential concerns about the ethics of keeping pets in small spaces. In Trill, Theobald shows us the world through the eyes of a budgie in its cage. 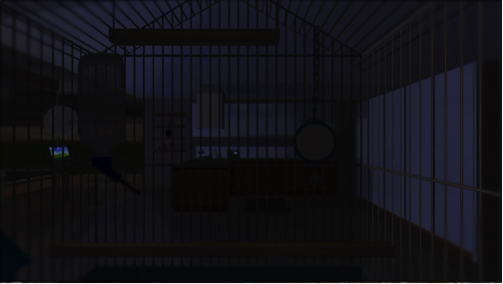 The four-minute animation begins in darkness and slowly lightens to reveal a modern-looking kitchen and dining room viewed from the back of a metal birdcage. The persistent hum of a refrigerator is heard on the soundtrack (see figure 8). As the sun rises outside the window and the room brightens, an electronic alarm clock fills the room with Edvard Grieg’s Morning Mood. Up to this point the perspective has remained fixed, but as the horizon is illuminated, the image tilts to the right and shifts three times to the left, accompanied by the sounds of chirruping. At this point in the animation it becomes clear that the first-object perspective being shown is that of the budgie as it flits around its cage (see figure 9). 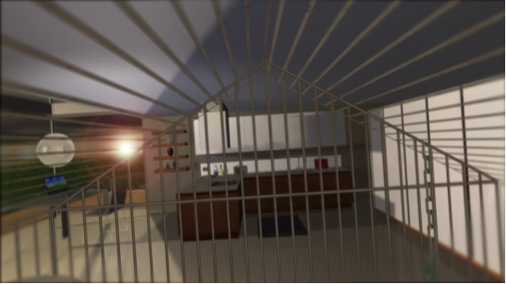 As the sun rises above the horizon and Grieg’s Morning Mood climbs to its crescendo, the virtual camera/budgie explores the cage from different angles, jumping between different points of space to the sounds of chirps and wings flapping. 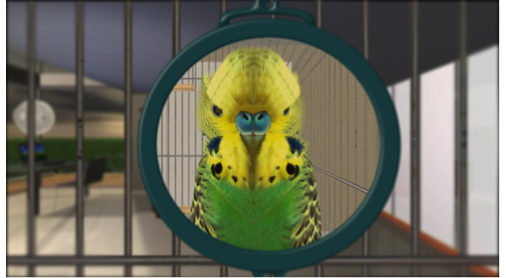 Halfway through the animation, the brilliant yellow, green and blue budgie stands in front of a small circular mirror in the corner of the cage, revealing itself as the subject/object of the gaze (see figure 10). It begins aggressively and repeatedly attacking its reflection, carrying the spectator along with it as it does so. Eventually the bellicose bird knocks the mirror to the floor of the cage and continues to peck at it before returning to its original position at the back of the cage. The music eventually stops and the animation ends by fading to black when the budgie closes its eyes. The moment that the budgie is revealed in the mirror is a key moment in the animation, since it allows spectators to see themselves as a non-human object. The cleverness and novelty of this sequence is humorous, but its lack of overt anthropomorphic “explanation” also highlights the strangeness of this behaviour. It may prompt spectators to wonder why do budgies do this? What do these birds experience? What is it like to not recognise oneself in a mirror? Observing the perspective of an unobserved object is to some degree an inescapable paradox. We cannot ever truly know what the world is like when we are not there to witness it. It is one thing to philosophise about how all objects exist equally and in partially withdrawn relation to one another, it is quite another to attempt to represent what it is like to be an object. Spectators of Theobald’s animations are, after all, witnessing objects relating to one another from a particular, privileged perspective. And these animations have been expressly made to reveal the secret lives of objects to us as spectators. This problem of representation returns us to the problem of correlation, where even the world imagined without us in it is still imagined through us. The task may be impossible, but Bogost argues that nevertheless it is the philosopher’s job to speculate about the private lives of objects and to “go where everyone has gone before, but where few have bothered to linger.” It is their job to attempt to encounter and describe the nature of objects and their relations to one another. Bogost calls this effort “alien phenomenology”. He notes that “speculative realism names not only speculative philosophy that takes existence to be separate from thought but also a philosophy claiming that things speculate and, furthermore, one that speculates about how things speculate.” Like the speculative realist philosopher, Theobald speculates. That is, he creates fictional yet plausibly realistic scenes where objects are relating to one another, seen through the perspective of a non-human, and non-anthropomorphised, object. The speculation involved in alien phenomenology is a creative act, and in this way Theobald is an alien phenomenologist, too. Usually philosophers speculate about objects through the written word, and speculative realists are given to detailed description and the endless listing of diverse objects. In its efforts to investigate the relations between particular objects more closely (namely, through examples or “speculative fiction”), OOO has been criticised for its “tendency to exceptionalise and anthropomorphise objects” by attempting to suggest, for instance “here’s how a tomato thinks.” However, anthropomorphism here can be explained as resulting from what Henrik Karlsson calls “embodied anthropocentrism”, which refers to the correlationist fact that “we necessarily and permanently think from a human perspective”. (This privileging of one object over another is reflected in the phrase “first-object perspective” that I have used in my descriptions of Theobald’s works.) However, alien phenomenology makes sure that this unavoidable anthropomorphism is at the very least a critical one, one that is aware of its limitations and its blind spots. The impossibility of fully escaping our embodied anthropocentrism does not detract from the deeply ethical effort of asking us to imagine the world from alien perspectives and to honour the integrity of non-human objects, in Bogost’s words, “as their own end product worthy of consideration, scrutiny, and even awe.”Bogost argues that the speculation at the root of OOO’s philosophical investigations is also a form of wonder, because it maintains the unknowable irreducibility at the heart of all things, and it respects them, maintaining a sense of awe at their very separate yet equal existence. Theobald’s animations share in this post-humanist respect for objects in themselves. By representing the unseen lives of non-human objects—a task that is at least partially doomed to failure—Theobald succeeds in offering spectators an opportunity to wonder at the fact that objects are always leading their own lives, whether or not we are watching. Virginia Woolf, To The Lighthouse (London: Vintage Books, 2004), 21. For Theobald’s artist statement, filmography and CV, see http://www.re-title.com/artists/david-theobald2.asp, accessed May 2014. Many of Theobald’s works are available to be viewed on his Vimeo channel. See https://vimeo.com/user1148942, accessed May 2014. “Speculative realism” is a term initially coined in 2007 by Ray Brassier in a meeting of contemporary philosophers Graham Harman, Quentin Meillassoux, and Ian Hamilton Grant. The term has since been modified to suit each individual philosopher’s approach to the problem of “correlationism”. Graham Harman, Bells and Whistles: More Speculative Realism (Alresford: Zero Books, 2013), 5. Levi R. Bryant, The Democracy of Objects (Ann Arbor: Open Humanities Press, 2011), 15. Quentin Meillassoux, After Finitude: An Essay on the Necessity of Contingency, translated by Ray Brassier (London: Continuum, 2008), 2. Ian Bogost, Alien Phenomenology or What It’s Like to Be a Thing (Minneapolis: University of Minnesota Press, 2012), 4. Emphasis in original. Bogost, 6. Emphasis in original. Ibid., 40. Emphasis in original. Bryant, The Democracy of Objects, 19. Timothy Morton, “Here Comes Everything: The Promise of Object-Oriented Ontology”, Qui Parle: Critical Humanities and Social Sciences, Volume 19, Number 2, Spring/Summer 2011, 163. Bogost, 30. Emphasis in original. Fredrik Karlsson, “Critical Anthropomorphism and Animal Ethics”, Journal of Agriculture and Environmental Ethics, October 2012, Volume 25, Issue 5, 707. Scott MacDonald, “The Ecocinema Experience”, in Ecocinema Theory and Practice, edited by Stephen Rust, Salma Monani, and Sean Cubitt (New York: Routledge, 2013), 20. Scott MacDonald, The Garden in the Machine: A Field Guide to Independent Films About Place (Berkeley: University of California Press, 2001), 5. MacDonald, “The Ecocinema Experience”, 19. Matthew Flanagan, 16:9 in English: “Towards an Aesthetic of Slow in Contemporary Cinema”, http://www.16-9.dk/2008-11/side11_inenglish.htm, accessed May 2014. MacDonald, “The Ecocinema Experience”, 20. Emphasis in original. David Ingram, “The Aesthetics and Ethics of Eco-Film Criticism”, in Ecocinema Theory and Practice, edited by Stephen Rust, Salma Monani, and Sean Cubitt (New York: Routledge, 2013), 56. Torben Grodal, Moving Pictures: A New Theory of Film Genres, Feelings, and Cognition (Oxford: Clarendon Press, 1997), 5. David Theobald, “Interview with David Theobald”, www.animateprojects.org, http://www.animateprojects.org/interviews/david_theobald, accessed May 2014. Andrew Darley, Visual Digital Culture (London: Routledge, 2000), 84. See also Jennifer M. Barker, The Tactile Eye: Touch and the Cinematic Experience (Los Angeles: University of California Press, 2009), 44-47; Paul Crowther, Phenomenology of the Visual Arts (even the frame) (Stanford: Stanford University Press, 2009), 153-172. Computer animation’s iconicity as a simulacrum can serve as an abstracted representation of the object, connoting its generalness, rather than its indexical specificity, which might serve a more ecocritical purpose. For instance, the landfill in Jingle Bells (UK 2013) might more readily be understood to represent landfills in general. Tobey Crockett, ‘The “Camera as Camera”: How CGI Changes the World as We Know It,’ Cinephilia in the Age of Digital Reproduction: Film, Pleasure, and Digital Culture, Vol. 1, edited by Scott Balcerzak and Jason Sperb (London: Wallflower Press, 2009), 122. Emphasis in original. Tom Tyler, “If Horses Had Hands…”, Society & Animals, Volume 11, Number 3 (2003), 269. Paul Wells, Understanding Animation (Oxon: Routledge, 1998), 15. Patrick Power, “Character Animation and the Embodied Mind–Brain,” animation: an interdisciplinary journal 3, no. 1 (March 2008), 37. Christopher Holliday, “From the Light of Luxo: The New Worlds of the Computer-Animated Film” (PhD dissertation, King’s College London, 2013), 128-129. Thomas Nagel, “What Is It Like to Be a Bat?” Philosophical Review 83, no. 4 (1974), 436. Ibid., 34. Phenomenology is one branch of anti-realist/correlationist philosophy that has some respect for and wonder about objects in the world outside ourselves, even if it ultimately reduces them to their appearance to consciousness. Ibid., 31. Emphasis in original. J. Thomas Tremblay (Jthomastremblay), “OOO: What it’s not”, Network Aesthetics/Network Cultures (blog for the University of Chicago English 50013, CDIN 50013, ARTH 40013, CMST 69300, ARTV 50100), November 12, 2013, https://networkaesthetics.wordpress.com/tag/speculative-realism/, accessed May 2014. Ibid., 120. Emphasis in original. Angeles: University of California Press, 2009. Know It”. Cinephilia in the Age of Digital Reproduction: Film, Pleasure, and Digital Culture, Vol. 1. Edited by Scott Balcerzak and Jason Sperb. London: Wallflower Press, 2009. 117-139. Darley, Andrew. Visual Digital Culture. London: Routledge, 2000. Animated Film”. PhD dissertation. King’s College London. 2013. Theory and Practice. Edited by Stephen Rust, Salma Monani, and Sean Cubitt. New York: Routledge, 2013. 43-61. Agriculture and Environmental Ethics. Volume 25, Issue 5 (October 2012). 707-720. About Place. Berkeley: University of California Press, 2001. Stephen Rust, Salma Monani, and Sean Cubitt. New York: Routledge, 2013. 17-41. Meillassoux, Quentin. After Finitude: An Essay on the Necessity of Contingency. Translated by Ray Brassier. London: Continuum, 2008. Ontology”. Qui Parle: Critical Humanities and Social Sciences. Volume 19, Number 2, Spring/Summer 2011. 163-190.
an Interdisciplinary Journal. Volume 3, Number 1 (March 2008). Theobald, David. “Interview with David Theobald”. www.animateprojects.org. Wells, Paul. Understanding Animation. Oxon: Routledge, 1998. Woolf, Virginia. To The Lighthouse. London: Vintage Books, 2004.